About 50 people have died in Haiti when their bus was swept away by a river gushing with rain dumped by Tropical Storm Fay, officials say. Two dozen other people managed to escape as the bus sank in the Glace river in south-west of the country. The storm is now moving over Cuba, bringing high winds and heavy rain. Fay is forecast to strengthen to a possible hurricane as it heads towards Florida, where a state of emergency has been called. Western and central areas of Cuba are being evacuated, as well as the Florida Keys. The storm passed over Haiti at the weekend, bringing torrential downpours. About 80 people were on board the bus that plunged into a swollen river on Sunday, officials said. One report said the vehicle had overturned as it tried to cross a bridge over the Glace river near the town of Bomont in the south-western province of Grand-Anse. Witnesses said many of those who died were swept away by the raging waters, while others, including about a dozen children, were trapped in the sunken vehicle. "The river swept them away as if they were driftwood," Bomont Mayor Oreste Andre told the Reuters news agency. Some two dozen survivors escaped by climbing onto the roof, he said. Several other people were killed in Haiti and the neighbouring Dominican Republic as the storm caused floods on the island of Hispaniola. As of 0900GMT, the US National Hurricane Center located the centre of the storm 170km (105 miles) south-east of Havana and 250km (155 miles) south-southeast of Key West in Florida. Moving at about 19km/h (12mph), Fay is expected to be near the Florida Keys by Monday night and could be hurricane strength, the NHC said. The NHC said maximum sustained winds were nearly 85km/h (50mph), possibly rising up to 120km/h, and a hurricane watch was now in effect for the Florida Keys and along the southern and western coast of the Florida mainland. Before Fay hit Cuba's southern coast on Sunday afternoon, officials in four Cuban provinces ordered the evacuation of more than 10,000 people from low-lying areas, along with tourists staying at coastal resorts in the storm's path. Fishing boats were pulled out of the water and farm animals were moved to higher ground, while temporary shelters and food distribution centres were set up. Jose Rubiera, Cuba's chief meteorologist, said that civil defence officials were mostly concerned about the effects of torrential rain. In the southern coastal city of Niquero, the authorities converted a hotel into a shelter for evacuees. "It's raining intensely, but the wind comes and goes," one of the hotel's employees told the Associated Press. Some 2,000 people had to leave their homes in the Dominican Republic and hundreds of properties were damaged. Florida's Governor Charlie Crist has declared a state of emergency, saying Fay threatened a "major disaster". But he insisted the state was prepared, ready and vigilant. In the Florida Keys authorities closed schools, opened shelters and urged visitors to leave. The main highway linking the Keys to the mainland was choked with traffic on Sunday afternoon, local police said. 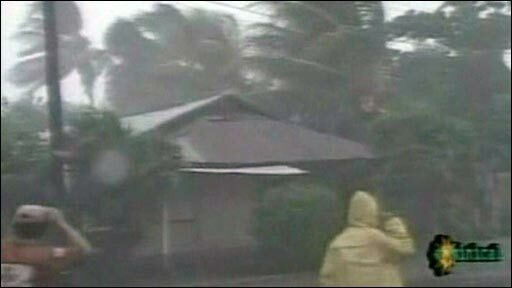 Residents of Miami have meanwhile been stocking up on bottled water, fuel and emergency items. 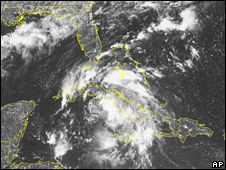 Fay is the sixth tropical storm of the 2008 Atlantic hurricane season. Two of the tropical storms so far, Bertha and Dolly, have reached hurricane strength - with winds of at least 119km/h.